We manufacture a wide variety of FRP tanks and vessels. 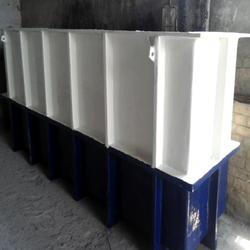 These FRP tanks & vessels are manufacture by using very high quality FRP, PP, PVC/FRP, PP/FRP, PVDF/FRP, FRB and FRVE. Beside this, we also install storage tanks, pickling tanks, rinsing tanks, settling tanks, acid oil splitting tanks, pressure vessels, reactors for acid alkali and many more. There are some features of these products are Made up of superior quality of raw materials, Its capacity is up to 100kl, these are Highly durable and reliable and high in performance etc. We manufacture a wide array of tanks and vessels using high quality FRP, PP, PVC/FRP, PP/FRP, PVDF/FRP, FRB and FRVE. Beside this, we also install storage tanks, pickling tanks, rinsing tanks, settling tanks, acid oil splitting tanks, pressure vessels, reactors for acid alkali and many more.